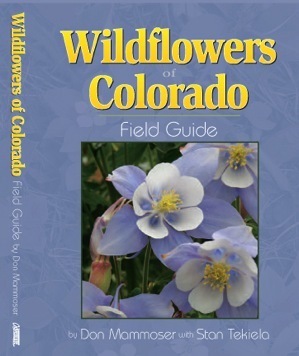 Here's the cover photo of the wildflower book. You can click on the image to be taken directly to the author's site to order a copy. As I’ve noted in many posts here on dcasler.com, my mother loves the wildflower pictures. That’s a good thing, because now I keep an eye out for them. So riding in the Colorado high country is not just about trails and GPS tracks, but training my eyes to look for bits of color here and there. Colorado wildflowers are usually not very big, sometimes with flowers only a half-inch (13mm) across. They look big in the pictures, of course. You can traipse through a high meadow and see nothing but green unless you stop and very deliberately look for the flowers. You’ll be delighted with the results. I was therefore delighted to find this little book on sale at a gasoline station south of Buena Vista, Colorado—my wife and I were traveling to Denver. It may seem a bit pricey at $16.95, but it’s chock full of color photographs and must’ve cost a mint to print. So, with this book in hand, I’ll go back through my wildflower posts and try to put names to flowers. If you see me make a mistake, please comment—a reply form is always at the very bottom of every post. This entry was posted in Product Reviews, Wildflowers. Bookmark the permalink.